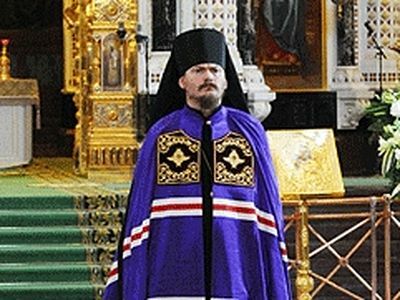 According to the website of the Exarchate for Orthodox Parishes of Russian Tradition in Western Europe (jurisdiction of the Patriarchate of Constantinople), cited by the French Orthodox website Оrthodoxie.com, the consecration as a Bishop of Archimandrite Job (Getcha) is to take place on November 30 in the Patriarchal Church of Holy Greatmartyr George at the Phanar (Istanbul) at the Divine Liturgy on the occasion of commemoration of Holy Apostle Andrew the First-called, the patron saint of the Patriarchate of Constantinople. The service will be headed by Patriarch Bartholomew I, with members of the Synod of the Orthodox Church of Constantinople, in the presence of the traditional delegation from the Vatican. 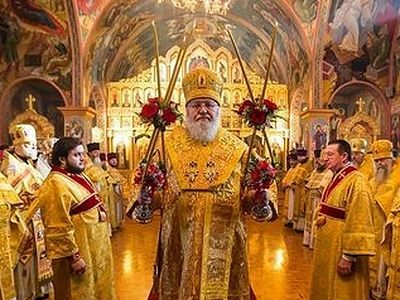 The enthronement of Bishop Job (Getcha) as head of the Russian Exarchate of the Patriarchate of Constantinople will take place on December 5-6—the feast-day of Holy Right-believing Prince Alexander Nevsky in the Cathedral dedicated to him in Paris—the Exarchate's Cathedral Church. At the Vigil service on December 5, the ceremony of enthronement will be held, and on December 6 the Divine Liturgy will be celebrated on the occasion of the patronal feast of the Church, which for the first time will be headed by the new Archbishop. 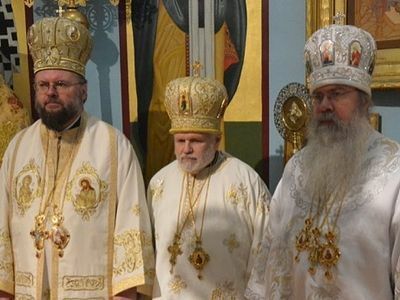 The General assembly of the Exarchate for Orthodox Parishes of Russian Tradition in Western Europe (the Patriarchate of Constantinople) on November 1 elected Archimandrite Job (Getcha) as next Archbishop. In the morning of November 2, Patriarch Bartholomew and the Synod of the Church of Constantinople confirmed Archimandrite Job's appointment as head of the Russian Exarchate with the title of Archbishop of Telmessos. Archimandrite Job (secular name: Igor Vladimirovich Getcha) was born on January 31 in Montreal (province of Quebec, Canada) to a family of Ukrainian émigrés. He belonged to the Ukrainian Orthodox Church in Canada, which initially had schismatic origins but then moved to the jurisdiction of the Patriarchate of Constantinople. He graduated from St. Andrew's Institute in Winnipeg and from the University of Manitoba (Canada) in 1996. In 1996 he became a ryassophore monk and was ordained a hierodeacon in the same year. He moved to France and became a monk in the Monastery of St. Anthony the Great (metochion of the Athonite Simonopetra Monastery in France) in 1998. He became an archdeacon in 1999. In 2003 he moved from the Ukrainian Orthodox Church in Canada (Patriarchate of Constantinople) to the Exarchate for Orthodox Parishes of Russian Tradition in Western Europe (the Patriarchate of Constantinople). In the same year he was ordained a hieromonk. He graduated from St. Sergius Orthodox Theological Institute in Paris. He is a cleric of the St. Sergius representation church in Paris. In 2003 he defended his doctoral thesis in theology: "The liturgical reform of Metropolitan Cyprian of Kiev" in the Paris Catholic Institute and St. Sergius Institute. He is a teacher of Church history and liturgics at St. Sergius Institute, and has been a professor since 2004. In 2003-2004, he was Dean of the parishes of the Russian Exarchate in Spain. From 2003-2006 he was a member of editorial staff of the Diocesan Bulletin of the Archdiocese for Russian Orthodox Churches in Western Europe journal and its French edition, Messager diocesain: Archeveche des eglises orthodoxes russes en Europe Occidentale. On January 9, 2004, he was raised to igumen, and on July 18 the same year, to archimandrite. In 2004-2010 he was a member of the Diocesan Council of the Exarchate. Since 2004 he was a member of the Committee for Relations with the Patriarchate of Moscow. He taught liturgics in the Institute of Postgraduate Studies of Orthodox Theology at the Orthodox Centre of the Patriarchate of Constantinople in Chambezy-Geneva (Switzerland) and in the Paris Catholic Institute. From December 2005 till December 2007he was dean of St. Sergius Orthodox Theological Institute in Paris. Since 2003 he has been a member of the St. Irenaeus International Joint Group for Dialogue between the Orthodox and Catholic Churches. Since 2005 he has been a member of the Joint Commission for the Dialogue between the Orthodox and Catholic Churches in France. Since 2006 he has been a member of the World Council of Churches (WCC) Central Committee. He is also a member of the Kiev Religious-Philosophical Society and the Society of Oriental Liturgy. On September 6, 2010, in the Cathedral of Christ the Savior, two Patriarchs—His Holiness Kirill of Moscow and All Russia, and His Holiness Theodore II of Alexandria— presided over the consecration of Bishop Nestor (Sirotenko), who will serve in Western Europe.